With today’s competitive real estate market and low inventory of homes, many first-time and move-up buyers are opting to purchase fixer-uppers with the intention of renovating. Not only is this an ideal way to purchase a property at the lower end of the market price, but it’s also a great way to customize the space to suit your design aesthetic and lifestyle, while increasing the home’s value. But, if you are like most buyers, you are probably on a budget. And, if that budget isn’t limitless, it’s very important to know what to look for before purchasing a house that needs a lot of work. Older homes often have underlying safety and construction issues, which can add to your budget and timeline. As a rule, homes from the 1950s and onwards are often well-built and in good structural condition, unlike pre-WWII homes which can have more structural, electrical and plumbing issues. You’ll want to be sure that the home’s foundation is solid and intact, free of large horizontal and vertical cracks, or cracks that have been repaired and separated again. Offsets in the foundation walls are also a cause for concern, as they are costly to fix – something you want to avoid when purchasing a home to renovate. A wet basement is expensive to repair and can cause serious health issues from mould and other spore growths if left unfixed. When buying a home to renovate, be sure to inspect for moisture problems in the basement using your eyes and nose. Basement water intrusion usually shows itself at the base of the foundation walls and in corners. If the basement is finished, look for staining on baseboard trim, drywall, behind furniture and underneath carpets, if possible. While some home buyers like the appeal of a renovated home, in some cases, these updates can hide pre-existing problems, such as shoddy electrical, plumbing and structural work. Instead, look for a home that is either in its original state or has not had too many renovation completed to it. The same can be said for homes with updated finishes, fixtures and other characteristics. Why pay to remove someone else’s recent renovation, like a remodelled kitchen, bathroom or basement? Rather, opt for a home with dated finishes for the greatest return on investment. The ideal house to renovate should have a drywall interior, not gybrock, lathe or plaster. Not only is drywall easier to remove, it’s also easier to match. Lathe and plaster crumble easily, which often requires the replacement of the entire wall when only part of the wall is being worked on. This can add to your labour and material costs, as well as your timelines. When it comes to electrical wiring, copper wires are one of the most preferred choices. However, in older homes, you may find existing knob and tube or aluminum wiring that will need to be re-done. This type of project is more time consuming and costly. If you can, purchase a home that is already run with copper wiring. As for the home’s plumbing, look for ABS drains and copper pipes, as they are easier to work compared to cast iron drains and galvanized water supply pipes. The latter can corrode and become plugged with lime, calcium, rust and other debris. They can also leak undetected inside a wall or cabinet, causing costly damage and mould. ABS drains and copper pipes are the preferred choices. An unfinished basement not only allows you to add your own personal touch with additional living space suited to your lifestyle, but it also makes it easier for your contractor to run new wiring and electrical to the upper floors. It’s also easier to spot foundation, water seepage and structural issues since there’s nothing lurking behind the drywall. If you are considering purchasing a home to renovate, connect with us at Inspire Homes to discuss your vision. We can provide valuable insight regarding the type of house that you should buy, so that your renovation goals are achievable come project time. 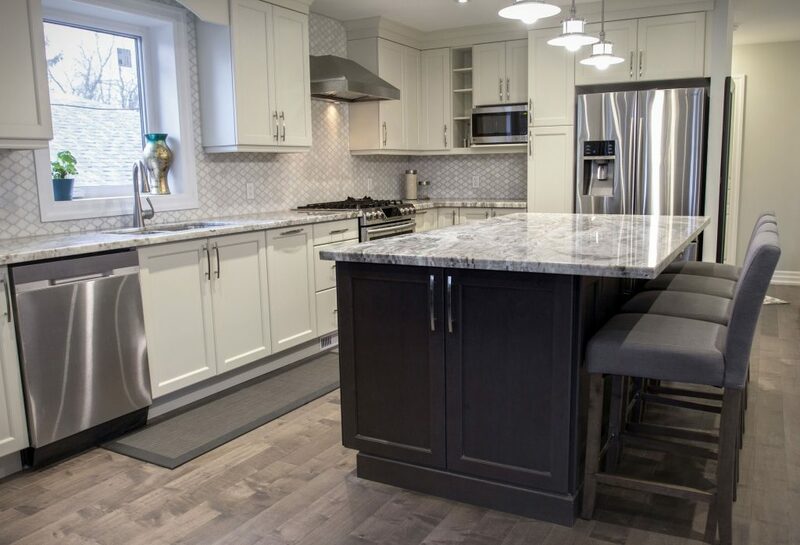 With over 13 years as an award-winning design build firm working with homeowners and families, we specialize in complete residential renovations, house additions and custom homes across Southern Ontario. This includes kitchen, bathroom and basement renovations, custom home construction and more. Contact us to learn more about our skills and qualifications or click here to view recent renovation projects in Toronto, Mississauga, Etobicoke, Richmond Hill, Schomberg, Nobleton and Blue Mountain.